The Science Center Free Admission Day! 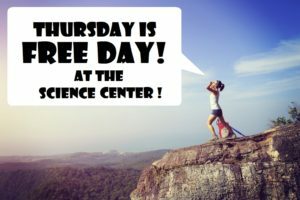 Thursday is FREE Day at The Science Center. FREE admission for everyone from 11am to 5pm! Members, you can beat the crowds and get in early for our exclusive MEMBERS ONLY hours from 10:00 to 11:00 am on Thursday and Saturdays! To enjoy this members perk and others, ask about becoming a Science Center member at the front desk or give us a call at: (618) 529-5431. If you are planning top visit The Science Center on FREE Day! with a large group, please call ahead to reserve a time for your group. Field trips to the Science Center MUST be booked in advance.